June 9, 2012 -- Last Saturday morning, I ran into Blaine Richardson, candidate for U.S. House of Representatives in the Second Congressional District, at the Northern Penobscot Republican "Candidate Kick Off" in Lincoln. We talked about his oath of office and how he is still bound by that oath, on leadership, the history of the problems the United States now struggles with, NDAA and the Patriot Act and the actions he plans to take to return us to a Constitutional government, discipline and accountability, reaching across the aisle, compromising one's values and balanced budgets -- or any budget at all -- among other things. "We've got an incredible grass roots support from Fort Kent down to Oxford County…Without this kind of support, it would just be impossible to do what we're doing…In the end, you need to look somebody in the eye, tell them what you believe in -- without a word salad…"
"…this was a call to duty me. Having taken a Constitutional oath when I went into the Navy, I felt on January 25, when I heard about the NDAA legislation that being in a position where I swore to uphold the Constitution against all enemies, foreign and domestic, that I needed to step up and go to bat for the country and myself and everybody else that felt the way that I did." "I think that there needs to be a rider on every bit of legislation that comes out of Congress that certifies that it does meet the Constitution. Passing these thousand-plus-page bills and then nobody knows what's in them until these little parts come out like little viruses…traumatizing the U.S. public and the taxpayer is hoi polloi, and then setting up a process that takes years to get to the Supreme Court…I think we can all write legislation -- we're all educated adults down there -- that meets the Constitution before…it gets to the President." "Kevin has been in politics his whole life. He was a political science major. He now has a wonderful mustard company, and I would encourage him to make that the finest mustard compay in the state of Maine; maybe in the world. Me, on the other hand, I'm not a politician. I haven't done this my whole life. I've fished commercially, I've worked in the woods, I've served my country in four conflicts, I have solved incredibly complex problems in a team environment under stress, under war conditions, and I can take that experience down to Washington." 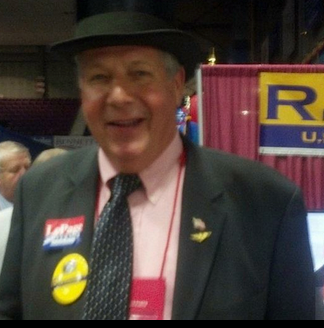 Blaine's campaign website is at Richardson for Congress 2012.